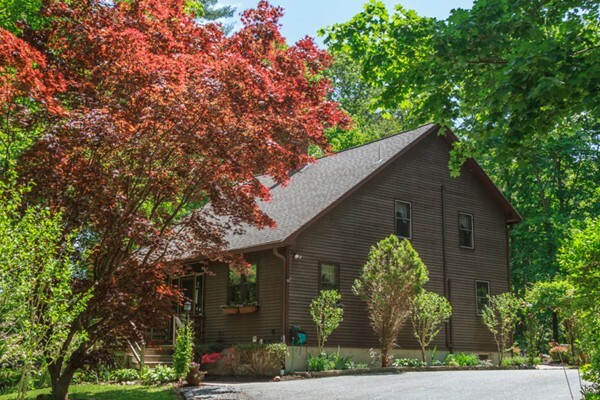 In a picture perfect setting surrounded by nature you will find this delightful 6 room Cape! This well maintained home has so much to offer. Bathed in sunlight, vaulted ceilings, gleaming wood floors, large country kitchen, living room with skylight and woodstove, first floor bedroom and full bath. The second floor master bedroom is a perfect retreat with great closet space and master bath. With summer fast approaching stay cool with ductless A/C. Take time to unwind and enjoy a good book on the most charming screened in front porch with ceiling fan. There are two rooms finished in the lower level basement and great additional storage space. Walk out to a well landscaped yard with lovely plantings and trees. Spacious deck, circular drive for ample parking, 2 storage sheds all on an acre+ lot. From this convenient location enjoy all this wonderful area has to offer! First showings this Sunday from 12-2 PM. Come take a look you will be glad you did! !